Alamo Drafthouse Cinema is pleased to announce that their latest theater expansion, Alamo Drafthouse Cinema – LaCenterra, will open for discounted staff training days on Monday, July 2nd. The theater’s official Grand Opening will be celebrated Friday, July 20th and feature the release of two highly anticipated sequels: MAMMA MIA! – HERE WE GO AGAIN and THE EQUALIZER 2. This state-of the art eight-screen dine-in theater is located on the southeast section of LaCenterra at Cinco Ranch, which is along the Grand Parkway about three miles south of Interstate 10. Alamo Drafthouse guests will find ample free parking in a brand new parking garage, which is located directly next to Alamo Drafthouse Cinema – LaCenterra. Alamo Drafthouse LaCenterra will offer full in-theater dining service and screen new releases, classics, independent films, foreign movies and Alamo Drafthouse’s unique signature programming. All theaters will feature 4K digital projection and state-of-the-art digital surround sound. Additionally, each auditorium eliminates the traditional front row, ensuring every seat in the house allows for a great viewing experience. The theater will have an adjacent bar/lounge with outdoor patio seating, serving up a large selection of craft beers on tap and handcrafted cocktails. The lounge will also feature an extensive list of popular and hard to find American Whiskeys. The Alamo Drafthouse LaCenterra’s soft opening training days are from Monday, July 2 through Thursday, July 19. During this time food and non-alcoholic beverages will be discounted. Guests will be able to reserve their seats for the Alamo Drafthouse Cinema LaCenterra Grand Opening and soft opening training days soon. The new Alamo Drafthouse Cinema LaCenterra will replace Alamo Drafthouse Cinema – Mason Park in Katy, TX. Alamo Drafthouse Mason Park officially closes Thursday, June 21. 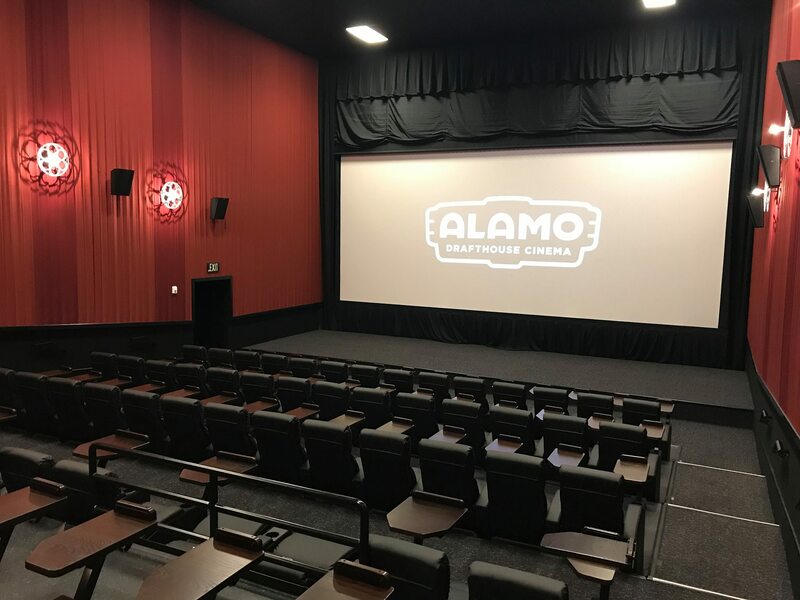 Alamo Drafthouse LaCenterra continues the company’s high standards of delivering the best possible theatrical experience to its guests including Alamo Drafthouse’s famous and strict “No Talking or Texting” during the film. Guests are encouraged to arrive early to enjoy curated pre-show entertainment. Instead of a barrage of advertising, Alamo Drafthouse presents a pre-show of rare (and often hilarious) clips specifically tailored to the feature film. Alamo Drafthouse Cinema was founded in 1997 as a single-screen mom and pop repertory theater in Austin, TX. Twenty-one years later, with 34 locations and counting, Alamo Drafthouse has been called “the best theater in America” by Entertainment Weekly and “the best theater in the world” by Wired. Alamo Drafthouse has built a reputation as a movie lover’s oasis not only by combining food and drink service with the movie-going experience, but also introducing unique programming and high-profile, star-studded special events. Alamo Drafthouse created Fantastic Fest, a world renowned film festival dubbed “The Geek Telluride” by Variety. Fantastic Fest showcases eight days of genre cinema from independents, international filmmakers and major Hollywood studios. Alamo Drafthouse’s collectible art gallery, Mondo, offers breathtaking, original products featuring designs from world-famous artists based on licenses for popular TV and Movie properties including Star Wars, Star Trek & Universal Monsters. Alamo Drafthouse continues to expand its brand in new and exciting ways, including partnering with the film distribution company NEON, Birth.Movies.Death., an entertainment content platform for movie lovers, and the American Genre Film Archive, a non-profit film archive dedicated to preserving, restoring and sharing film. LaCenterra at Cinco Ranch is the Katy area’s ultimate Dine-Shop-Play-Live-Work destination. Blending uptown style and old town charm, LaCenterra offers upscale shopping, dining and entertainment in a relaxed Main Street-style setting. LaCenterra at Cinco Ranch is located on the western edge of metropolitan Houston in Katy, TX. Conveniently situated off the Grand Parkway at Cinco Ranch Blvd., LaCenterra is just three miles South of I-10 and primarily serves Katy, Fort Bend county and the Cinco Ranch master planned community. Triple Tap Ventures LLC owns and operates the Houston metropolitan area, Lubbock and El Paso Alamo Drafthouse Cinema locations. Triple Tap Ventures and its principals are focused on developing, owning, and operating strong regional and national hospitality and entertainment concepts.